The F7 drive is the industrial workhorse that can handle every conventional application found within the typical industrial plant, from the simple conveyor to sophisticated networked packaging. All of this is possible with the smart and flexible design platform of the F7, providing both normal and heavy duty rating, three modes of control, network communication options, application specific drive software, and an array of standard and optional input/output devices. Applications: The Yaskawa F7 vfd drive is the Industrial Workhorse that can handle every conventional application found within the typical industrial plant from simple variable torque pumping to sophisticated networked material handling. 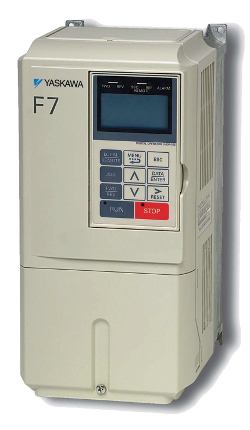 Features: The Yaskawa F7 vfd drive is designed for tough industrial environments. It is rugged and reliable, with an MTBF of 28 years. A variety of enclosure options provide the right environmental protection. The dual ratings, Normal and Heavy duty, enable the most economical match of overload capacity for the application. To provide the optimum control method, the F7 can operate in conventional V/f, V/f with encoder feedback, open loop vector, or closed loop vector mode. Drive performance can be further enhanced for a specific application with optional drive software. Call us today at 1-800-681-7374 for all you Yaskawa vfd drive needs. 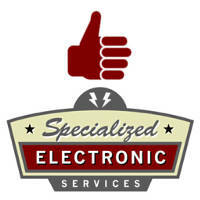 Don’t forget we are authorized by the factory to do warranty repairs and startups on new equipment.